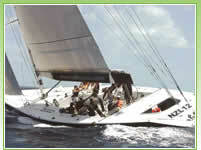 Get on board one of 2 ex-team New Zealand America's Cup racing yachts for a day you won't soon forget. The staff will explain the safety and operational aspects of these sleek racing yachts, so you'll feel comfortable and ready to sail. A tender boat will whisk you to the yachts, where you will board and have the opportunity to take the helm, grind a winch, punch a stop watch...or just sit back, relax and enjoy. Then, THE RACE IS ON!! 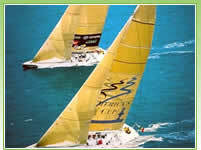 You'll have two hours to show off your sailing skills as you attempt to outwit and outrace the opposing yacht. Afterward, we'll speed you back to the dock for a celebratory drink where you can share your experiences with your fellow racers. Wear comfortable footwear with non-marking soles. Bring hat, sunblock and cash or credit cards for photos, videos and t-shirts. Non-alcoholic drinks are included in the tour. This tour is not operating on New Year's Day morning due to Junkanoo parades. The minimum age to take this tour is 10 years old. All passengers are encouraged to participate in the crewing of the yacht, but it is not a requirement. Customary gratuity to the crew is not included.